Continuing to share other people's personal information in the shadows (especially when they've clearly and explicitly expressed their wishes for it to be destroyed) is one of the biggest **** moves possible and it needs to stop. All parties involved with anything should stop being complete **** and destroy any of Prune's personal information that they might have. What have I done to you? Nothing, so stop. I have not shared any personal information. This is the internet, dox me how many times you need I don't care anymore. I don't see a reason to remove my image because it's already hosted on imgur and can be accessed by anyone. If thuggishprune did the same as me then none can help him. I guess he posted his image in the big "image of you" thread. People save those images to do image reverse searching to find people. I added mine there because I don't care. you're drunk. you know where you want to go. So he shared all his information? What I remember was this only a picture which was shared in the huge "image of me" thread. People save those pictures like I said before. People that post their own image of them self in that thread should know that it could lead to image saving. Anyway, I have nothing else to contribute to this thread. Bye. People save those pictures like I said before. What did you do to get banned Sqwairle? I'm probably sleeping now, you should sleep too. ..............So, you got banned, and they won't give you the reason. Hm, it's strange indeed. Can't believe this would happen. You must figure the meaning of the name I give to you. Only then, you can get unbanned. I have already talked with him a bit, but that was a while ago so he probably doesn't remember. He knows it was unjust. there is nothing wrong about posting a pic of a Prune. No. This is exactly what is wrong. You have absolutely no reason to post someone else's personal information or pictures without their consent. 18 year old aspiring music producer, designer, animator and programmer. Apparently i share a pic of Prune (that he shared on Picture of yourself, but removed by Diff or Gosha for trying to prove me wrong), on Discord by saying 'furry', cause even him calls himself furry (I made some search, and he deleted his Twitch account). Apparently he was hurt and cried cause of that, but that's not what my DM was showing months ago.. But there is nothing wrong about posting a pic of a Prune. Actually i had really valables reasons to post his face, and there is nothing wrong cause if the image was a problem, it should never have publicly posted it so that my beautiful person face-toy with it, although i knew how to remain very serious when using it. Also deleted my twitch account what? I've never deleted a twitch account. 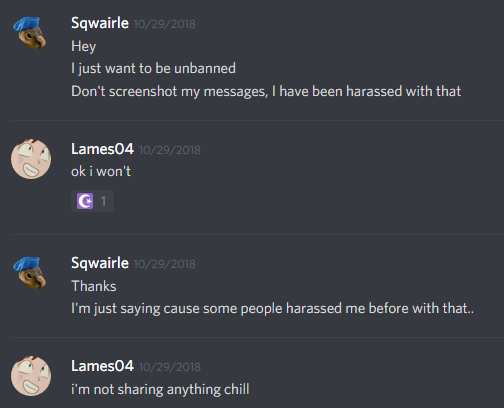 You're admitting to actively online stalking me so you can get unbanned on a flash game discord? I have a problem with my self image, which is stemmed from a slew of personal issues/previous relationships. I decided to delete my picture off that topic shortly after posting it, however gosha added it to the main post, which I missed and Diff quickly deleted it after this fiasco started. Sqwairle used it to harass me by calling me a furry (which I am very vocal about my absolute disgust with furries), and has been creepy about this entire ordeal. ...'cause I got personal issues. So yeah. Might wanna think twice next time... kid. Yea because asking to be left the **** alone when dealing with personal stuff online is me putting up that sort of facade. Sqwairle has been asked to end this nonsense with Discord and Prune. He is no longer allowed to discuss either on the forums. Show's over, thank you all for stopping by. So, for once, i wanted to know what is that nonsence meant and why me ? Sqwairle, can you stop lying? You most definitely have alts. I have proof. 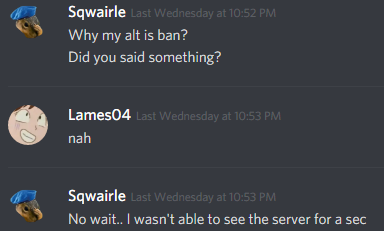 Sqwairle said that he doesn't have any alts as soon I mentioned in the server that he might have one. 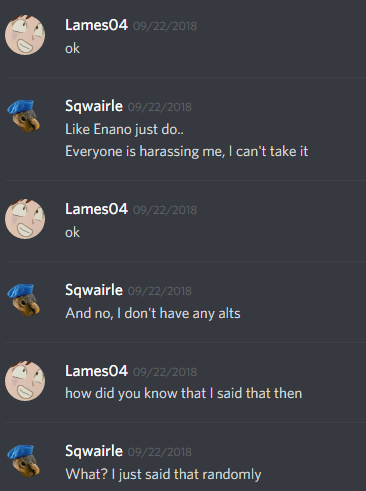 Sqwairle saying that he has an alt on the server. 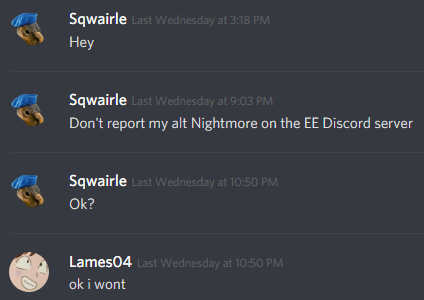 Side note, nightmore isn't his alt, he's just pretending that an innocent user is his alt to get them banned. Not the first time he's done this btw. Do whatever you want to do, dude. If you want to join, nothing is stopping you except for yourself. If you don't, it's okay too. I don't join zones where people are rude. This forum is an exception.